Specializing in everything bridal we offer a wide variety of wedding invitations, favors and accessories. 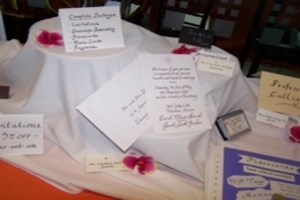 Send your invites with style by taking advantage of our professional calligraphy services. We offer affordable nationwide service. Many font styles to choose from. Elegant Wedding Services is absolutely splendid. They did the calligraphy for my invitations and place cards. The calligraphy was beautiful and I got many compliments.